A week from today Canada and USA will kick off their 2 match series in Houston. The U20 team has often been overshadowed by the senior side and hasn't received the attention it deserved, both in financial support and media coverage. This year some of that neglect has been self inflicted. The management team this year have decided that a low key approach was the way to go, they put out word that there was a ban on match video and they turned off the camera at Westhills and then Abbotsford in subsequent weeks when live streaming was already ongoing. It's a change of policy from years past and the current spy vs spy mentality may be a reflection of the desperation in the entire men's program due to the downward spiral of the senior team and the unexpected scenario of having to qualify for the World Cup through repechage. The reason given for turning off the cameras was to prevent the Americans from getting a glimpse of the team. I suppose it never occurred to management that the Americans had scouts at the games at Westhills and Abbotsford? Just to add to the paranoia I was told from a reliable source they had eyes on the intersquad match at Shawnigan. The spy novel Canada U20 v USA U20 is coming soon to a bookstore near you. We can look back at the simpler times in the good old days, way back to 2015 when Canada had Romania over for a series to prepare for the American matches. They innocently live streamed the game and put the highlights up on YouTube, then went on to smash the Americans 65-29 in the two game series including a 41-6 win in the final match. It was back in the days when Canada were confident enough to show off their U20 program to fans and even to opponents, this is what we have, try to stop us. In 2016 Canada lost to USA in Texas on the final play of the game. That one hurt. In 2017 Canada were on the ascendancy again and split the games but won the first one handily enough to claim the series. Now it's 2018, we'll see how it goes. Canada played two warm ups, against a FV U23 team and a BC U23 side. They won both easily. We even found a non-redacted report of the match on the BC Rugby website. 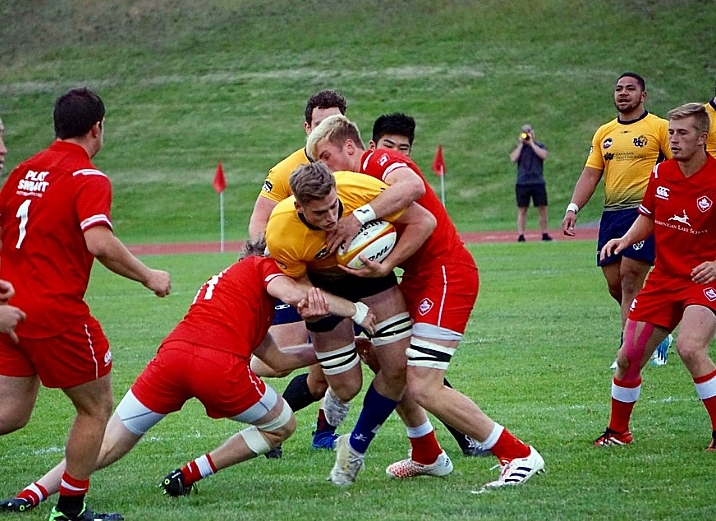 Rugby Canada used a heavily edited version of the report on their website, minus the link to the photo gallery. It's all hush hush though so don't share the image gallery with any of your American friends, they apparently have image predictive software that can map out an entire team's performance from a single image. If you want to gather some intel on the American team, their press release is here. One interesting observation is 6 of the players are from MLR squads. The JWRT tournament is held in Bucharest, Romania this year from August 24 to Sept 10. The winner of the Canada v USA series will represent North America. Details on broadcast are forthcoming although the Canadian delegation may be pushing for a blackout so the Romanians, Samoans, Uruguayans, Fijians, Namibians, Portugese and Hong Kongers don't get a glimpse of the competition.